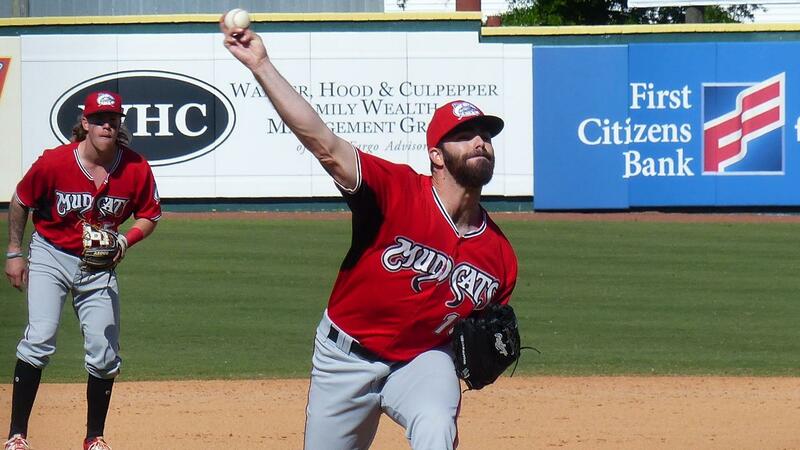 ZEBULON, N.C. - The Carolina League announced its honorary year-end All-Star team today and the Carolina Mudcats are pleased to announce that pitcher Luke Barker was voted as the league's relief pitcher of the year. Barker went 6-4 and pitched to a 2.21 ERA while leading the Carolina League with 20 saves and 38 games finished. He also totaled 63 strikeouts against 16 walks over 61.0 innings pitched and held opponents to a .213 average in 46 appearances (second most in the league). The 26-year-old additionally led qualified Carolina League relievers in fewest baserunners/9 IP ratio (9.30), while also finishing third among relievers in lowest batting average against (.213), fifth in highest strikeouts/9 IP ratio (9.30) and fifth in lowest BB-IBB/9 IP ratio (2.36). The Chico, CA native did not get his first save chance until May 4, but started his season a perfect eight of eight in save opportunities before suffering his first blown save on June 29 in Salem. That save opportunity was only one of three missed by Barker all year and occurred in what was his sixth consecutive appearance as Carolina's primary closer. In all, Barker converted 20 of 23 save chances and pitched to a 1.80 ERA with 28 strikeouts (25.0 IP, 22 H, 5 ER, 5 BB) in save opportunities during the 2018 season. Barker, a Chico State University product, was signed by the Brewers as a non-drafted free agent in November of 2016 after spending his first professional season with Traverse City of the Independent Frontier League (1-4, 1.44 ERA, 42 G, 62.1 IP, 10 BB, 83 SO, 11.98 SO/9 IP). After signing with Milwaukee, Barker was first assigned to Low-A Wisconsin for the start of the 2017 season where he went 1-4 with a 2.84 ERA, five saves (nine opportunities) and 34 strikeouts over 31.2 innings pitched. He was then transferred to High-A Carolina on July 9, 2017 where he went on to go 1-1 with a 3.68 ERA and 14 strikeouts over 22.0 innings. Barker returned to Carolina for the 2018 season where he would then set career highs in games, saves, innings and strikeouts. Per the Carolina League's release, Salem's Bobby Dalbec was named Most Valuable Player, Potomac's Will Crowe was named Pitcher of the Year and Winston-Salem skipper Omar Vizquel was named Manager of the Year. Voting for the year-end All-Star team, and for the 2018 Carolina League superlatives, also announced today, was done by league managers, team general managers and local media. The Carolina Mudcats are the proud Carolina League, Class-A Advanced affiliate of the Milwaukee Brewers. First established in 1991, the two-time Southern League Champion Mudcats are entering their 28th consecutive season of baseball at Five County Stadium in Zebulon, N.C. The 2018 season marks the first for the Mudcats under the ownership of the Milwaukee Brewers organization.